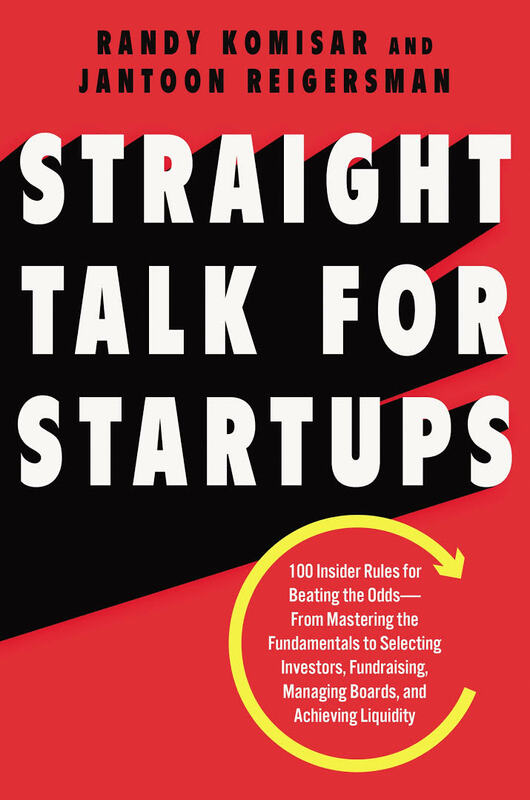 With subtitle 100 Insider Rules for Beating the Odds–From Mastering the Fundamentals to Selecting Investors, Fundraising, Managing Boards, and Achieving Liquidity, Randy Komisar has an ambitious goal in writing his new book Straight Talk for Startups and he executes! Komisar is a Silicon Valley veteran (and brilliant) investor. I have already mentioned here his previous books The Monk and The Riddle and Getting to Plan B, as well as many of his advice. 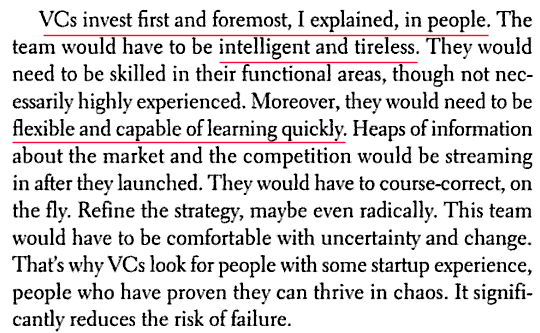 In his new book, he is trying to give precious advice because “entrepreneurs today don’t have the luxury of learning by trail and error.” [page xix of the introduction]. The Times They Are A-Changin’ and the stakes are just too high…So Komisar gives “the crucial things, like creating two financial plans, not one; hiring part-time epxerts rather than full-time trainees; knowing what to measure and the pitfalls of doing it too early: and the criticality of unit economics and working capital.” [Page 1]. I have to admit I was a little surprised with reading the previous sentence, but after discovering the next first rules, Komisar convinced me again. 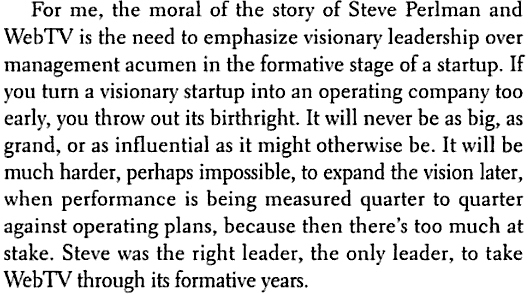 It is a great complement to Measure What Matters and the proof (if what was needed) of how great great venture capitalists are…! This entry was posted in Must watch or read and tagged Kleiner Perkins, Komisar on June 21, 2018 by Hervé Lebret. It’s the second book I read from Randy Komisar (after the Monk and the Riddle) and I have to admit I preferred his first book even if Getting to Plan B is quite good too. I might have been slightly misled by the title even though the subtitle was quite clear, Breaking Through to a Better Business Model. But it might be I never read seriously subtitles. I thought the book was about what you do when you were wrong first. But it is more subtle. It is not so much about what happens if your idea was not good vs. what about finding a better or valid business model. If it says better, you plan A might have been good enough! The other reason I was not totally convinced comes from my feeling the case studies were chosen to illustrate a theory, a process, a framework, but did not prove it. I had the feeling the same case studies might have been used to illustrate opposite views, but again, who am I to say such things! Mullins and Komisar’s book remains a very good book thanks to a rich variety of cases and lessons. In their preface, the authors say important things. “Entrepreneurship is not easy. [..] they are countless tales of companies that quickly went down in flames. Ultimately [many of them] failed because the economics of their business model didn’t work” [Page viii]. I was a little puzzled because I am not so sure; many companies failed because customers did not buy. But it might be the same! 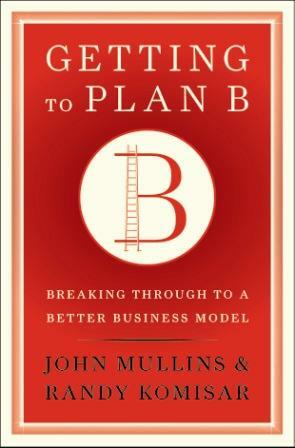 The authors claim “they developed a process and a framework to discover the best business model” [page ix]. Again I am puzzled, I am not sure this exists. But still, they certainly provide interesting tools. One of the most interesting one is the use of analog and antilogs, that I had already mentioned when reviewing Ries’ Lean Start-up. Again For the iPod, the Sony Walkman was an Analog (“people listen to music in a public place using earphones”) and Napster was an Antilog (“although people were willing to download music, they were not willing to pay for it”). Analogs are successful predecessors worth mimicking in some way whereas antilogs are predecessors (whether successful or not) in light of which one explicitely decides to do things differently [Page 14]. But when they claim Apple’s plan B was to transform itself from a struggling PC maker to a consumer electronics powerhouse [page 21] , I find the broadness of the plan B concept really too broad! Then their methodical dashboard is about validating leaps of faith by testing hypotheses. And what is new compared to other important references such as Steve Blank’s customer development is the focus on the business model through 5 elements: revenue, gross margin, operating expenses, working capital and investments. Now the book shows that success does not have only one way. 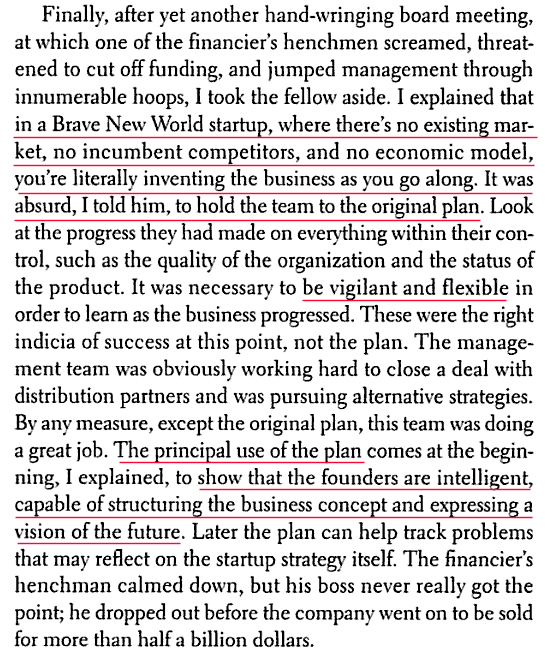 The Silverglide case [pages 74-78] shows that an entrepreneur can succeed with $80k for friends and family money whereas I am not even sure how many hundreds of millions Jeff Bezos needed before reaching profitability for Amazon.com [pages 186-192]. Many case studies illustrate how to optimize each of the 5 business models elements [chapters 3-7], whereas chapter 8 shows that you will need to find a balanced solution trying to get the best of these 5 key financial objectives. Amazon.com needed to reach a very large size to make its automated process worthwhile but “great lessons are born from leaps of faith” [page 192]. – all comprehensively organized, in just the right sequence, to inform and create the five elements of your business model. There is clearly in the eraly 21st century a new trend in that business plans may not be a sufficient tool, not to say even necessary. 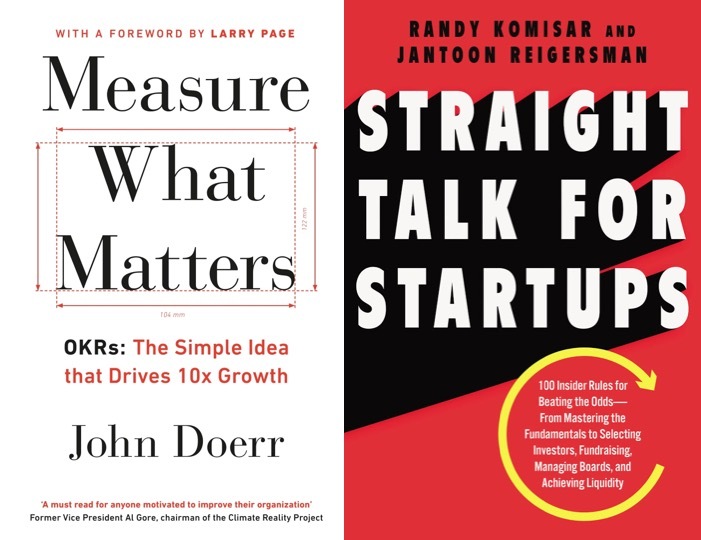 From Randy Komisar, through Eric Ries, to Steve Blank (including my recent account of Cohen’s Winning opportunities), the important element is the discovering process of your business, of your customers in an iterative and flexible manner. This is clearly an important lesson to remember. This entry was posted in Innovation, Must watch or read and tagged Business Plan, Innovation, Komisar on October 3, 2012 by Hervé Lebret. 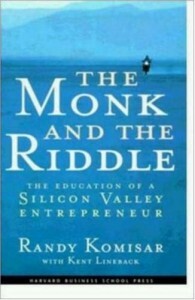 Do not ask me why this book is entitled The Monk and the Riddle as I will let you discover it if you decide to read this “old” book (a more than 10 year-old great piece of Silicon Valley description). Its subtitle is clear though: The Education of a Silicon Valley Entrepreneur. Not all agree on the fact it is a great book as you may find at the end of this post, from the comment by the Red Herring in 2000. Still, I loved reading this book and let me explain why. 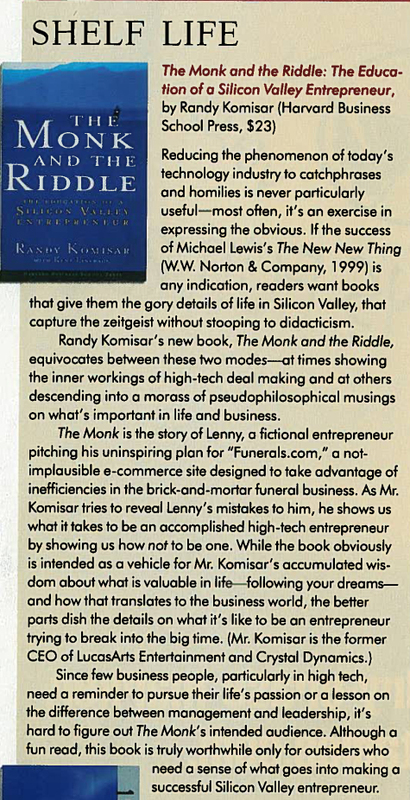 Randy Komisar, today a partner at Kleiner Perkins and former enrtepreneur, has written a book about passion and inspiration. 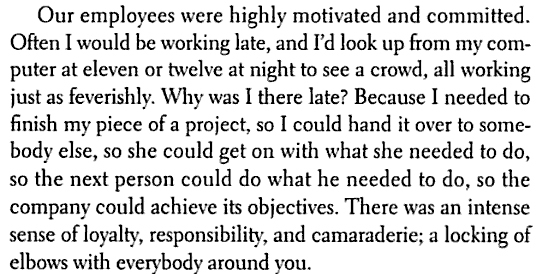 He does not tell you how to do your start-up (but he tells you how not to do it). 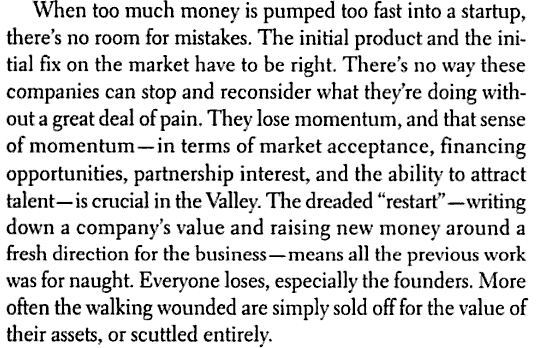 He also explains also very well what Silicon Valley is, the locus of risk taking, where failure is tolerated, where a start-up is more a romantic act than a financial endeavour. “Business isn’t primarily a financial institution. It’s a creative institution. Like painting and sculpting.” [page 55] Here are a more few extracts I scanned from Google Books. –	the risk of doing something that fails to express – or even contradicts –who you are. And there is the most dangerous risk of all – the risk of spending your life not doing what you want on the bet you can buy yourself the freedom to do it later. If your life were to end suddenly and unexpectedly tomorrow, would you be able to say you’ve been doing what you truly care about today? I really advise you to read this great book, not only for the Riddle but also for the nice, funny and sad story of Lenny and Allison. Enjoy! 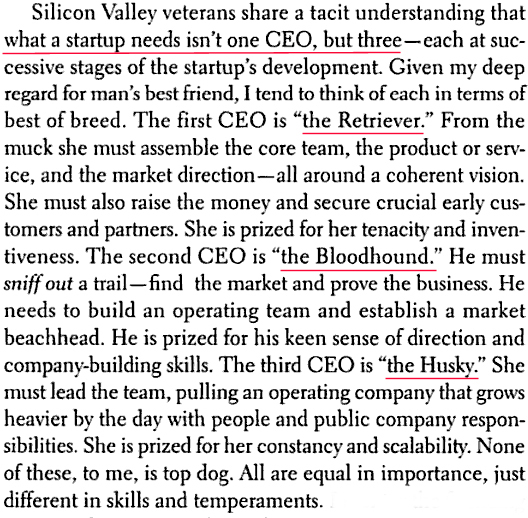 This entry was posted in Must watch or read and tagged Komisar, Red Herring, Silicon Valley, Venture Capital on July 26, 2011 by Hervé Lebret. This entry was posted in Silicon Valley and Europe and tagged Komisar on January 25, 2011 by Hervé Lebret.